Why all these preparations? Because that Master is coming for whom everyone was waiting. 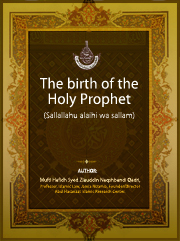 He is the One, the glad tidings of whose arrival were given by the Prophets. He is the One, to be in whose Ummah was the wish of Hadhrat Moosa (May peace be upon him).